Olyvia Chac: How did you start Milk on the Moon? What was your inspiration to curate content that was focused on just boba? 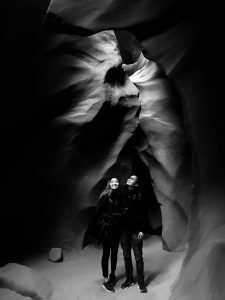 Ly & Hop together at Antelope Canyon in Page, Arizona. Hop Hoang: It’s a mixture of our passion and it gives us a chance to be creative. Ly Nguyen: We have creative history but we didn’t have a medium to be creative and we really wanted to start something on our own…we’re technical people and wanted to do something far from technology. . . I started making some milk tea at home on my own about 3 or 4 years ago…I go to boba shops all the time and I thought “what about the people who don’t have access and can learn to make it at home”. HH: It’s a mixture of undeveloped skills..something we don’t do on a daily basis, like marketing, photography, and content creation….it took inception….it took four to 3 months to build content….it took like to build. HH: also what should we release first and who is our audience..she had a crazy idea and I had a crazy idea and we thought it was something crazy to unravel. OC: Why boba though? Why not coffee or tea per se? LN: There are plenty of paleo, vegan, and other types of blogs but not boba though. . . it’s easy for you to go out and buy it but sometimes the quality is not all there. . . we love boba. . .it’s representative of young Asian American culture and cuisine. OC: Quite the traveling duo, did you find some inspiration from abroad and did some recipes spawn from that? LN: I like local boba shops that came from international places like China, but mostly Taiwan…I try to find inspiration, like coffee shops in Taiwan and Singapore…one that I really enjoyed and one that I posted in my recent post, called “brown sugar, iced milk with boba”…in Taiwanese, the name is actually directly translated as the “frog hitting the milk” because it looks it frog eggs in milk. 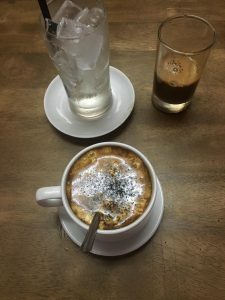 Creamy egg coffee (bottom center) and sweet, milk Vietnamese iced coffee from Luu Gia Cafe & Food in Saigon, Vietnam. This was taken by Ly during her most recent visit to Vietnam in 2018. OC: Between the two of you, how many countries have you traveled to? LN: Wait weren’t you born [in Macau]? That doesn’t count, you were a refugee there! HH: Uhh, it totally counts. Doesn’t it, Olyvia?! OC: That does count, Ly. LN: Okay so, I have also been to Canada, Mexico, Vietnam, Hong Kong, Japan, China, Thailand, wait – do layovers count? HH: If you have a layover, it doesn’t count! LN: So…Indonesia, Singapore, Iceland, wait – did you put down Thailand? OC: Yes ma’am, I did! OC: But out of the all posts and inspiration you have kind of built so far, content-wise, which one was had the most interesting combination? HH: Butterfly [Pea Ombré Lemonade]? It’s a tea lemonade ombré drink. It’s one of our first drinks we started the blog with. OC: What’s that? The rocks… with cheese? 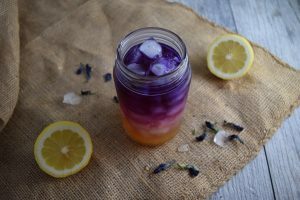 Butterfly Pea Ombré Lemonade was the first drink that Ly & Hop recreated in their food lab and the first drink featured on the blog. LN: I know it sounds weird but there was this chain called “happy lemon”..and they have it here in NorCal….there famous for a series drinks with salted cheese….like crema…it tastes really thick kind of like cheese…If you google the rock salted cheese, if you look into Google, like even the insider and other sites feature this cheese…it tastes a little more savory than anything. HH: I don’t think it’s savory..hmmm. LN: I think it tastes savory. HH: salty and spicer rather than sweet. OC: Do you have anything to say to your readers today? LN: I don’t know can you say something clever Hop? HH: Thanks for checking us out, share your thoughts with us and share your recipes! Ly is a software engineer by day, foodie by night, and Instagram model in her dreams. She loves to travel and her body is made of 80% boba. Her guilty pleasure is the smell of dogs. Hop is a product manager by night, professional meat eater by day, and Chief Boba Drinker of Milk on the Moon in his side hustle. He named his 10 year old yorkie after Leonardo Dicaprio, who he thinks is handsome. A boba brick & mortar may or may not exist in the future. Discover more recreated drinks on Milk on the Moon’s homepage and follow them on Instagram and Facebook for new, monthly drink recipes.